Remembering Our Dear Friend | What's that, UASC? 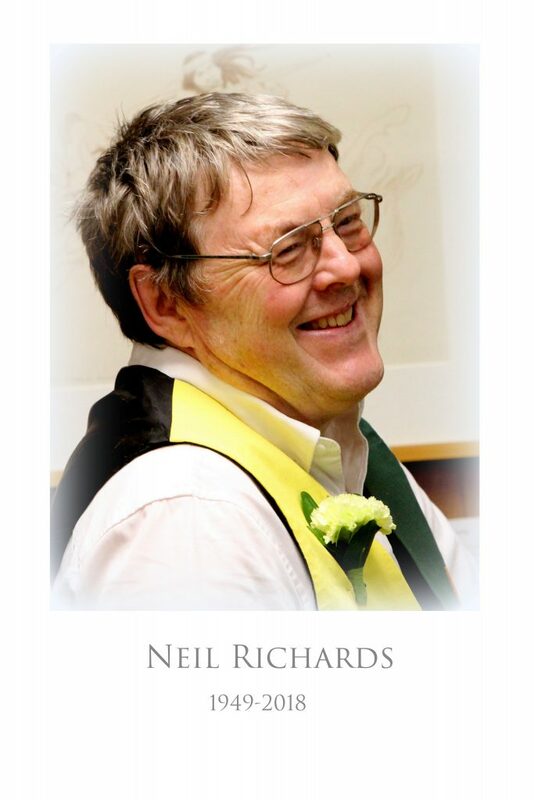 From around the time of his retirement in 2005 to his passing in 2018, Neil Richards made the University of Saskatchewan Archives and Special Collections his home away from home. He had chosen to spend his retirement years doing what he loved: collecting rare or locally relevant materials related to LGBT+ lifestyles. Every morning he would enter with his distinctive shuffling step. A few jokes, a cheeky grin, a cup of coffee, and then he would settle down at his desk and begin a day of catching up on the latest in Queer news and chasing down the unique treasures that sang to his collector’s heart. These treasures would arrive in stacks of enticing packages, colorfully stamped. But Neil would always wait to open them until the afternoon — he enjoyed the anticipation. His desk was always piled high with these treasures–everything from sardonically witty postcards to comic books to a handwritten letter by iconic lesbian author Radcliffe Hall. Often, on my journeys back and forth across the archives, he would excitedly gesture me over, show me his latest E-Bay find, explain to me the fascinating history of the unassuming lavender pamphlet he held in a hand that had leafed through books by the thousands. His hands seemed to have an intelligence to them, as though he was able to gauge the value of anything he picked up just by touch. The joy Neil found in hunting down something rare, something unique, something one-of-a-kind was always present and often contagious. He inspired me to begin my own collections, showed me that collecting was not just about accumulating but about sharing, learning, and loving. The Neil Richards Collection of Sexual and Gender Diversity, and all of Neil’s collection work was very much a labour of love, and in this post, I would like to share with you some of that work. Over the past thirteen years, numerous exhibitions, digital displays, blog posts and articles have been created around Neil’s collections. What follows is a (not nearly comprehensive) list of links to some of these byproducts of Neil’s devoted collecting work. Celebrating Saskatoon Pride: 25th Saskatoon Pride Festival – As a salute to Saskatoon Pride and its work, we highlight here a handful of our recent library acquisitions to the Neil Richards Collection. Freedom to Read Week 2016: Some controversy-causing children’s books from the Neil Richards Collection. Queer Negative Literature: Why Collect it? Leading Change in the Library, One Book at a Time: The most recent issue of Generations features an article on Neil Richards, a 29 year veteran of the University Library and the man behind the institution’s massive collection of LGBT materials. Transqueery: Miki Encounters the Neil Richards Collection: Miki Mappin, a somewhat eccentric trans gender individual is asked to submit a proposal for an artwork which would engage with a queer collection at the University of Saskatchewan Archives. U of S houses one of the largest LGBT archives in the country: As part of their coverage of Saskatoon’s Pride Festival, CBC radio interviewed the man behind the Neil Richards Collection for Sexual and Gender diversity. This entry was posted in Richards Collection on January 30, 2018 by Stevie Horn. What a wonderful article, so beautifully written and describes Neil perfectly. I can just see him there at his desk doing the things he absolutely loved to do. I was saddened to hear of his sudden death and I send my deepest sympathies to everyone at UofS Library. He will be dearly missed. I just love this photo of him, it captures his true essence with that cheeky grin full of love and a great big heart of gold. I’ve known Neil since 1975 or thereabouts. I know his spirit lives on with all of us and I’m glad he was part of my life journey. Thank you for writing such a terrific article.